A car crashed through the window of a pub in London, injuring a pedestrian. 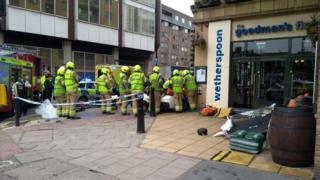 Firefighters had to cut the driver free at the Goodman's Field, a Wetherspoons pub in Mansell Street, near Tower Hill, after the crash at 10:00 GMT. A man was arrested on suspicion of drink-driving and dangerous driving and taken to hospital, the Met said. Paramedics took a female pedestrian to hospital but her injuries were not serious. The pub was closed for a short time but has reopened.